BLISS TOWNSHIP — There are a few things that Michigan still does very well. Its three big universities — Michigan, Michigan State, Wayne State — and network of smaller public colleges and universities, are terrific. Ann Arbor, Grand Rapids, and Traverse City compare with anyplace in America as great places to live and do business. And we have Blissfest, the affirming, heartening folk/blues/acoustic music festival founded in 1981, and ever since has held the second weekend in July, on a stretch of grass and woods in northern Emmet County, as the place to be in the upper Midwest. Three elements come together each summer that elevate the festival to a transcendant experience. The first is talent. I dance and listen and think how deep the country is in skill and intelligence and grace, especially among its young. We send a second rate mind to the White House and keep him there for eight years. Our popular icons of the moment are Paris Hilton and the $10 million People Magazine photo of Brad and Angelina’s baby. But Blissfest is a fresh reminder that our very best people are doing something much more worthwhile, including the poets and singers and musicians who play here each summer. The second element is the festive, gentle, smiling, appreciative people who show up to listen. In a crowded, frantic, time-pinched world people look for touchstones and community. That’s why Facebook, and Myspace, and motorcycle clubs, and churches, and all the other places that people connect are so eagerly sought. Community has largely departed the traditional spaces it once occupied in America, particularly neighborhoods. People are moving too fast, working too hard to stay even. But it’s reassembled in new places. And for the 6,000 or so people who spend the weekend camping in Blissfest’s pasture and forest, listening to great music, dancing , eating good food, and reacquainting, this music festival is a true community. The last time I spoke to my friends Keith Breuker and Chandra Demers was a year ago at Blissfest. The longest conversations I have all year long with a whole bunch of other people I know in Michigan occur at Blissfest. I spent good time this weekend with Charles Griffith, my friend and colleague who directs the auto project at the Ecology Center, Ann Arbor’s capable and effective environmental organization. I hadn’t seen him since last year at Blissfest. The third element is hope. On Sunday, nothern Michigan showed us blue sky and warming sun all day like only she can. 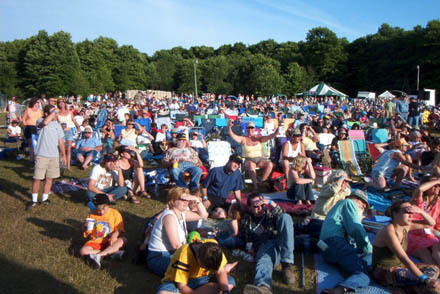 So many people, essentially strangers, gather on 40 acres of northern Michigan for three days of music, fun, food, and dance. Children run in little packs and their parents don’t worry. Young people laugh and carry on in a way that is entirely engaging. People share and invite and seek each other’s company. It makes you think that somewhere, sometime down the road that things will get better.